This time we're taking a look at Onmyoji, the enormously successful RPG from NetEase. With more than 200 million downloads already under its belt, it's now finally localised in English and available worldwide. To be a top grossing mobile game in China is the holy grail for many developers. Reaching the summit in the world's biggest mobile games market is no mean feat. However, when such hits emerge from Asia, attention quickly turns to whether they've got what it takes to become that rarest of things: a truly worldwide mobile success. The best recent example of this would be Lineage 2: Revolution, which is currently performing well in the US and Europe – proof, then, that there is room for complex Asian RPGs in the Western market. But Onmyoji, coupling reams of dialogue with a dizzying array of interlocking resources and currencies, feels like an even tougher sell. The same unfamiliar aspects that make it a welcome change from my perspective, as someone who plays free-to-play games regularly, could also be considered to be alien and confusing. It's certainly a game with a learning curve, which is unusual in itself in today's mobile market. Boil it down though and at Onmyoji's heart are the same collection-fusion-gacha mechanics with which mobile gamers all around the world should now be well-versed. The titular Onmyoji are demon-hunting summoners, that each draws power from a Totem. The de-facto leader character in any squad, the Onmyoji can be powered up by feeding Souls – a resource purchasable with soft currency and often given as a reward – to its Totem. But the process is more familiar for the regular squad members – here called Shikigami – which can be summoned using premium currencies and upgraded by combining with unwanted characters and soft currency. This soft currency is called Coins, earned for winning battles and completing achievements. Jade, described in-game as a 'rare currency', can be used to summon Shikigami. But there's more. 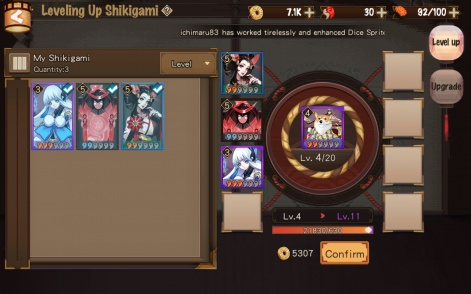 Amulets can also be used to summon Shikigami – Broken Amulets can be earned through regular play and yield one regular Shikiami, while Mystery Amulets each yield one rare Shikigami and can be bought in bundles using Jade. And Jade itself isn't the game's true hard currency, as it cannot be bought using real money. It can instead be exchanged for S-Jade, which comes in bundles ranging from $2.99 for 30 to $99.99 for 1,200. 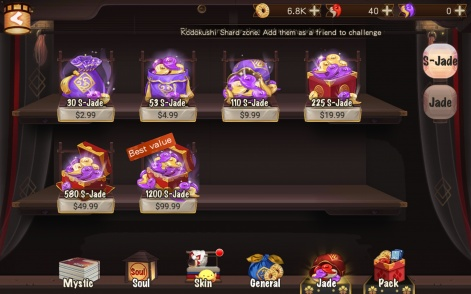 S-Jade's main function is to purchase packs at the game's mall. Many of these packs contain some kind of consumable, timed EXP booster – the effects of which can be paused and un-paused at will. It becomes a compelling offer, especially when combined with annuities, as is the case with the EXP Boost Pack which includes a 100 per cent EXP boost every day for three days. There are also annuities that distribute Coins or Jade daily for a set period of time, as well as those that combine both immediate and timed rewards. The best example of this would be the Promo Beginner's Pack, which includes – amongst other items – 50,000 Coins immediately, followed by seven daily doses of Amulets, Souls, AP (the game's energy currency) and 50 per cent EXP boosts. All this costs a mere 10 S-Jade, which equates to around $1 in real money. 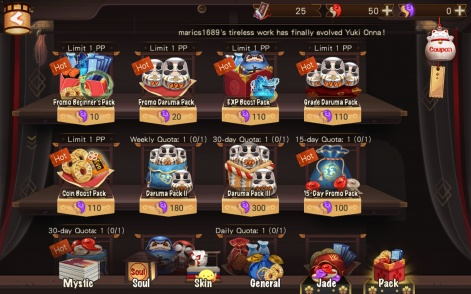 It's a no-brainer for anyone planning to invest serious time into Onmyoji, and that's very much the point. It may only convince the player to invest the minimum amount of $2.99, but it also increases the chances of them spending again. All this and we've still barely scratched the surface of Onmyoji and all its various resources. There's the aforementioned energy currency AP, which is capped at 100 and can be refilled for 60 Jade. There are also two currencies specific to Souls, the items used to level up an Onmyoji's Totem, called Orochi Scale and Orochi's Reverse Scale. Orochi Scale can be found in Soul Zones and exchanged for a Plain Soul Box, while Reverse Scale can be used to buy an Exquisite Soul Box. The latter can also be bought in some packs from the Mall. If something in Onmyoji could feasibly have its own currency or resource attached, it probably does. Skins for your Onmyoji are also available and cost Skin Tokens, which are occasionally given as rewards for completing achievements or participating in events, but appear in packs too. What is no doubt becoming clear is that if something in Onmyoji could feasibly have its own currency or resource attached, it probably does. And believe it or not, this serves a purpose other than to confuse things significantly. It simply means that the player's money doesn't go so far. If everything is priced in one hard currency, it's easier to make that investment stretch. But with everything priced in different currencies, each bundled separately, it's much more difficult. Indeed, it seems that the entire reason for the separation of Jade and S-Jade is so that one can be gifted while maintaining the value of the latter by making it strictly purchase-only. This all sounds quite damning and does undoubtedly mean that investments in other free-to-play games would get you more bang for your buck. However, should you be the type of player with no intention to spend whatsoever, Onmyoji is still designed in such a way that it remains more open and enjoyable than many others. How does Dragon's Watch monetise?